WINNIPEG, Canada (Sporting Alert) — Nigeria came from two-goals down to earn a massive point against Sweden in their FIFA Women’s World Cup Group D opener at Investors Group Field in Winnipeg, Canada on Monday. The Swedes, although not playing at their best, took a first half 2-0 lead through an own goal by Desire Oparanozie in the 21st minute and a Nilla Fischer close range poker in the 31st. However, Nigeria, who looked the better team in the first half and were very unlucky not to have scored at least one goal, came roaring back in the second half. A stunning finish by Ngozi Okobi pulled a goal back for the Africans in the 50th minute, before Asisat Oshoala got the better of Fischer to score her team’s second three-minutes goal later, as the scores were knotted at 2-2. 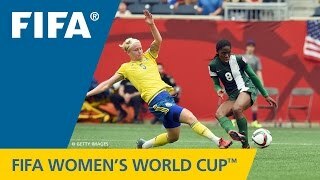 Nigeria looked very confident afterwards and went in search of a third, which opened gaps for Sweden to exploit and the Europeans grabbed the lead back on the hour mark when substitute Linda Sembrant guided home a cross from inside the six-yard box. But just when the game looked done and dusted, the Super Falcons found another way back and it was Francisca Ordega, who slid a ball under the legs of Hedvig Lindahl in the 87th minute to shock Sweden and grabbed a massive point for her team ahead of the next fixture against Australia. I feel OK after our first match. They expected to win, and at the end of the day we got a draw. Prayer is a key for the Nigerian team,” Nigeria coach Edwin Okon said. Sweden head coach Pia Sundhage, on the other hand, wasn’t happy about the final outcome. We’re not happy that we gave up three goals, however, at the end of the day we got one point and there’s good things to bring to the next game,” Sundhage sai. Sweden will take USA in their game of Group. Okobi, for her outstanding display on the evening, was awarded with the Player of the Game honour and she truly deserved it. The Nigerian attacker was sprinted throughout the contest, which unsettled the defensive line of Sweden.